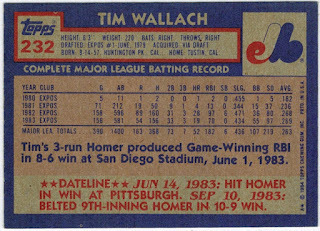 Card Review: 9.5 I gave 1984 Topps a "9.7" grade. I'm knocking this one down two tenths of a point due to the superfluous gold stamping running down the side. The card looks better without it, but 1984 Topps is such a classic, that it takes more than a little stupid stamping to ruin one. This card was recently sent by a reader (his package post is coming soon). 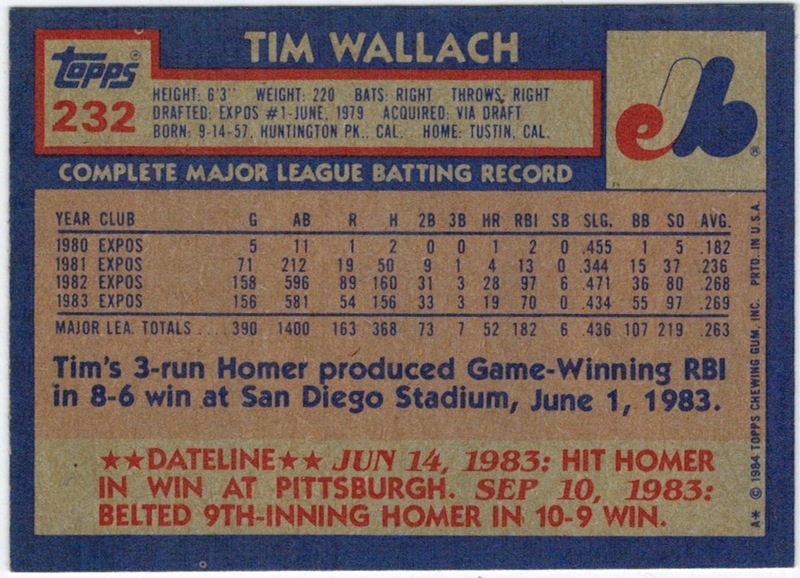 I haven't really made an effort to purchase these when they pop up, as I don't really feel a burning need to pay a dollar plus for an 1988 Topps Wallach, when they can be had for mere pennies elsewhere, especially these that have been degraded with extra stamping. In my outdated vintage universe, this stamping is frowned upon, and lacks the novelty of adding the character that some kid's hand writing on the front of a '52 noting a trade to the Browns brings with it. That said, I need one of each because I'm a prisoner to my own o.c.d. impulses. I don't need one of each color, but I'd like one of each year. This is the first '84 I've seen. 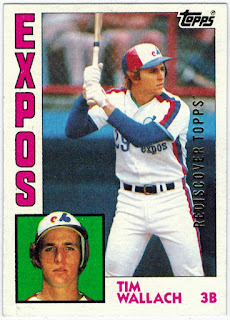 I'm now short '82, '83, and both '86 (base and All-Star), assuming those even exists.